Blogging the Beatles: The Beatles’ last show at the Cavern Club, 50 years ago this month. Brow Beat is following the Beatles in “real time,” 50 years later, from their first chart-topper to their final rooftop concert. 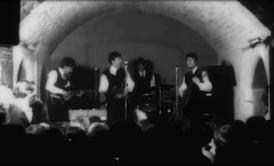 Fifty years ago this month, the Beatles played their final show, after almost 300, at Liverpool’s Cavern Club. That night, it looked like Lennon might never be invited back. But six years later, when John Lennon brought his group by for their last show at the Cavern, the times had changed. The Quarrymen had become the Beatles, they had played the club almost 300 times, and they had transformed the venue into the center of Liverpool’s exploding rock scene. The Beatles at the Cavern Club in 1962. When they first started there, and it was still a jazz club, it didn’t help that Lennon hated jazz and all its fans. “Jazz never gets anywhere, never does anything,” he said, “it’s always the same, and all they do is drink pints of beer.” Still, the Beatles itched to play the Cavern because jazz clubs were one of the only places that people actually paid attention to the music. And they made the best of it—partly by including things other than music in their performances. Much of what they did was comedy: skits and jokes and impersonations. Frequently the electricity would cut out—according to Louise Harrison, the place got so sweaty that the perspiration would drip onto the equipment and cause a short—but the Beatles would fill the time by leading sing-alongs, leading the crowd in singing silly tunes like “Coming ’Round the Mountain” or the jingle from the Sunblest bread commercial. They were not very tidy and not very clean. They smoked as they played and ate and talked and pretended to hit each other. They turned their backs on the audience and shouted at people and laughed at their private jokes. But there was quite clearly enormous excitement. They seemed to give off some sort of personal magnetism. I was fascinated by them.